KATHMANDU, Nov 26: With just five days remaining for the National Reconstruction Authority's self-declared deadline to sign the housing grant agreement with earthquake victims in the Kathmandu Valley, the authority has been able to sign grant agreements with only 37 percent of the total eligible victims so far. Of the total 94,072 households identified as eligible for the housing grant of Rs 300,000 in the Valley, the NRA has signed grant agreement with only 34,987 victims. The NRA had started the process of signing grant agreement from the last week of October but even after a month, the task has failed to gain momentum and the NRA is unlikely to complete the task within the deadline. 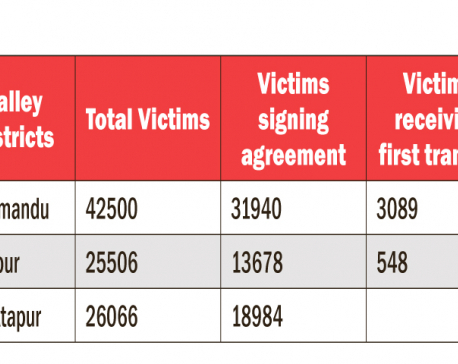 In Kathmandu district, the NRA has signed agreement with 23,979 of the total 42,500 households while 6,024 of 26,066 households in Bhaktapur have signed agreement so far. Likewise, 4,984 of the total 25,506 households in Lalitpur have signed the agreement. Ganesh Awasthi, the chief of the Implementation Division at the Ministry of Federal Affairs and Local Development who oversees grant distribution on behalf of the NRA, said that the local bodies will complete signing grant agreements with all the eligible victims in the Valley within the remaining five days. “We are trying our best to complete the work within the deadline. The number of households signing grant agreements will go up from Sunday,” he said. He said that the ministry aims to complete the task of signing grant agreement by November 30 and distribute the first tranche of Rs 50,000 to them by December 10. “The NRA has already released the money but we were not able to distribute it to those who have signed agreement as the authority had not signed grant agreements with the banks. Now that the NRA has completed signing agreements with the banks, we will start distributing the first tranche to the victims,” he added.